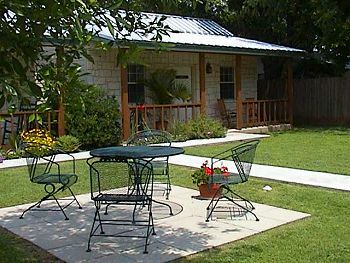 Fredericksburg Texas B&B Mainstreet Cottages consists of three quaint cottages nestled in a quiet backyard in Uptown Fredericksburg. The cottages are within walking distance of fine restaurants, famous specialty shops, museums, and art galleries. Each of the three cottages has a fully equipped kitchen with microwave, kingsize bed and Jacuzzi tub with shower, electric fireplace, cable TV, private telephone lines, ceiling fans, and CH/A. Cottages are named after famous German painters, and inside you will find artwork of the honored artists. A homecooked gourmet breakfast is brought right into your cottage on a tray. By special request, experienced Massage Therapists will come into the cottage and apply massages or other spa treatments. This and other Fredericksburg Bed and Breakfast Inns can be found here online in The Register.